This recipe could be used by the new moms to quench their babies hunger as it might be that they get tired from the work or could also be used as a healthy breakfast for much older kids or oldies. 1. For babies of 8-9 months or older, put the oats straight from the packet and add the sultanas to them. 2. Now put the oatmeal in a sauce pan, add 2-3 tbsp of water or milk. Bring it to boil. When it boils reduce the flame. Stir it constantly with light hands. Finally cook it on the simmer for 2-3 min. Do not stop stirring each time so that it doesn’t stick on the base, until cooked. 3. 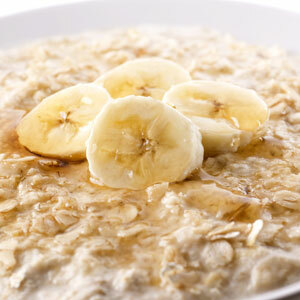 Mix the bananas into the cooked porridge with a very light hand.